Timothy J. Cooley is an Associate Professor of Ethnomusicology at the University of California, Santa Barbara, where he teaches courses on Polish and North American vernacular and popular musics. He is also Affiliated Faculty with the university’s Global and International Studies Program. His edited volume, Shadows in the Field: New Perspectives for Fieldwork in Ethnomusicology, now in its second edition, is a standard text for students of ethnomusicology. His second book, Making Music in the Polish Tatras: Tourists, Ethnographers, and Mountain Musicians, won the 2006 Orbis Prize for Polish Studies. 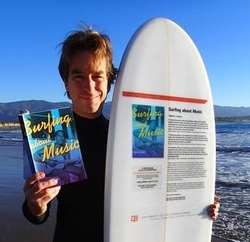 Cooley’s new book, Surfing about Music, considers how surfers musically express their ideas about surfing and the surfing community, and how surfing as a sport and lifestyle is represented in popular culture. He grew up surfing off the east and gulf coasts, and moved to California in 1998. Cooley also enjoys singing, playing guitar, banjo, and violin. Cooley also recently visited the Hawaiian Book and Music Festival where he presented the book.